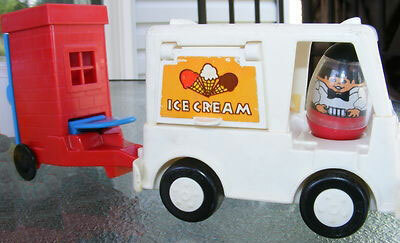 Description: Disguised as a mild-mannered ice cream man, Super Weeble heads out in his truck and trailer. Change his identity in his office, then press the lever that sends him through the roof. Zap... he lands on none-other than Mr. Trouble! 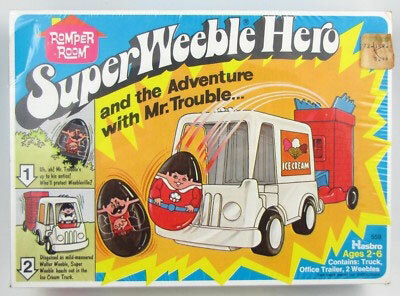 Super Weeble hustles him bacl into the truck that changes into a jail. You change mild-mannered Walter Weeble into the fearless Super Weeble, by simply turning the base of the Weeble! Ice Cream Truck - HTW355 - Small white 1-seat "van" that rolls on 4 small black wheels (wheels marked "Weebles") with white hub caps. One side of the van has a rectangular "door" that lifts up and has a barred window behind the door. Inside the van has a slide and swing-out door on the back for Weebles to slide and fall out the back door. Orange rectangular litho with 3 icecream cones and "ICE CREAM" in white. Small orange litho with 3 icecream cones and "ICE CREAM" in white. Top corners of litho have rectangular cut-outs. Trailer - HTW356 - Squared red brick "building" with a blue door on one side, a 4-pane window and blue lever on the other side, a blue roof, and triangular base (hitch on front) and 2 small black wheels under the "building". Press blue lever to make Weeble figure inside fly up/out through the blue roof. Walter Weeble - White Shirt, black bowtie, black belt with coin-change return in center. 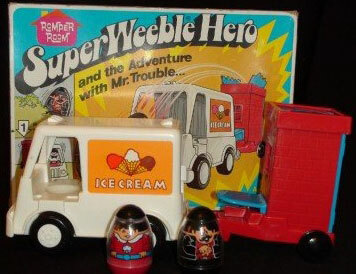 Super Weeble - Red shirt, white collar, blue belt, white "w" on chest. HTW358 - Mr. Trouble - Black base, black top (hair), wearing a red shirt under a black jacket. Twisting hands together.